Co-organized by the International Institute for Asian Studies (IIAS) and the Social Science Research Council’s Transregional Virtual Research Institute (TVRI). We are pleased to invite applications for six days of interactive Winter School training on Media Activism and Postcolonial Futures. 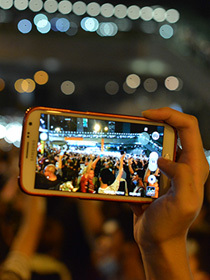 There has been growing scholarly interest in better understanding the role of media technologies—from Weibo and WhatsApp to cloud computing and location-based services – in transforming the nature of social movements worldwide. But “Twitter revolutions” that subvert existing structures of media and political power are only a part of this story. The Arab Uprisings also taught states across the Middle East, North Africa and Asia how to tame media activism and deploy digital tools for control. Media activism spread across ideological spectrums and has brought to the forefront not only youth and pro-democracy movements. It has also been used successfully by political parties to embrace ethno-nationalist agendas and enable closer alliances with neoliberal capital and military power. These varied political logics and fates of media activism since 2011 make clear that triumphalist accounts of “media technologies-as-liberation” require revision; there is a pressing need to embed media and technology-centric perspectives on activism in an account of historical context and institutional power. In this Winter School, we are interested in exploring these multivalent dynamics of digital media activism in postcolonial contexts where historical and contemporary legacies of global power relations shape and inflect media and political practices. Specifically, we will trace how media industries, from news to entertainment, from social networking services to commercialized broadcasting sectors, create new modes of politics building on existing political divides between middle class minorities and majority publics. We will also consider how the politics of ethnicity, religion, caste/race, gender and sexuality shape these new modes of political engagement. In this process we will pay attention to the role of the state and the expanded influence of established commercial media industries in generating new forms of public-private surveillance and control. Finally, we will consider the shifting political valences of digital activism, paying attention to how political energies have been re-oriented towards right-wing populism and new digitally enhanced modes of authoritarianism. The Winter School will allow PhD students and advanced research masters’ students with significant professional experience, including journalists and researchers allied with social movements, to problematize these questions in the politically dynamic setting of Hong Kong. Hong Kong is an ideal city to discuss the dynamics of media activism historically and in the present given its postcolonial status, unique media systems in relation to mainland China, and its ongoing power struggle following the Umbrella Movement of 2014. The genres of mediated expression and the question of "political voice"
The Winter School will be held from Jan 16-21, 2017, at the C-Centre (Centre for Chinese Media and Comparative Communication Research) at the Chinese University of Hong Kong. In addition to lectures by leading scholars in the field, students will also conduct group projects and enjoy fieldtrips to important sites of media politics in Hong Kong, such as public broadcasters, commercial press, independent media platforms, NGOs, and new and old sites of activist struggles. At the end of the Winter School, students will make final presentations to the public including the social movement and media organizations they study. Francis Lee, Zaharom Nain and Srirupa Roy will lead the Winter School with Paula Chakravartty as guest co-convenor and Jack Qiu as host co-convenor. Coming from different academic traditions with diverse theoretical and methodological expertise, the lead trainers and co-convenors shall foster an active atmosphere of open discussion, critique, and empirical inquiry. The goal is to facilitate students’ existing research projects in a related field of study through a combination of lectures, fieldtrips, and group work. We welcome applications from doctoral students and advanced research master's students with significant related professional experience from all social science and humanities disciplines, based in Asia (including West Asia) and globally. For additional details on eligibility criteria and how to apply, see the online Application form. The registration fee for participation at the IIAS/SSRC Winter School is 250 Euro. For more information on what is included in this fee, please see General information. Photo Credit: "DSC_4082" [cropped] by Max / C.C. 2.0.